In this double post for What I Wore Sunday, it was funny to see pretty much the same outfit but a week apart! I love love love this blouse! It is cool in summer and so comfy to wear. It has a gorgeous kind of retro bow tie and it sits really nicely. Any excuse to wear flowers! 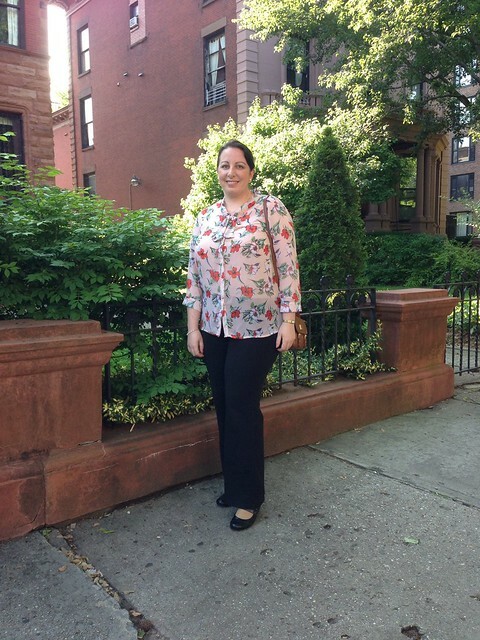 It was a little bit muggy on Sunday morning so I wanted to wear another cool blouse. The sad thing in this photo is that it is not possible to see the gorgeous detail on the blouse. I have loved Peter Pan collars ever since it was part of my high school uniform and so the minute I saw this blouse, I had to get it! Please venture over to Fine Linen and Purple to see more WIWS posts with some awesome reflections… and outfits!! Woohoo! 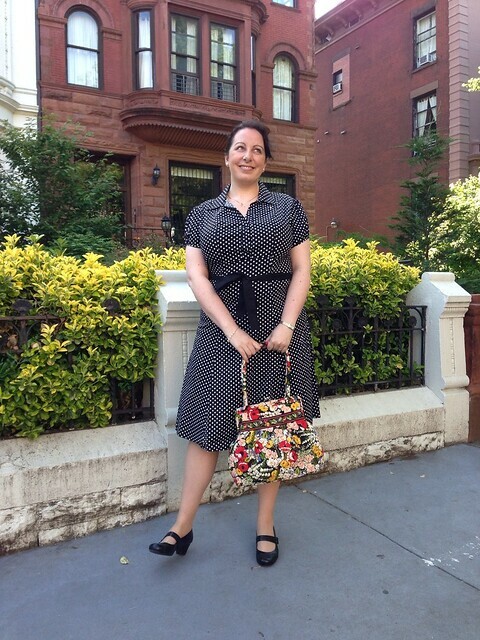 This week we have a bumper double edition of What I Wore Sunday! I forgot to do my post last week, but looking at the photos they could be in two different hemispheres. It was so cold last week, I had to get my old winter coat out and today it was so humid and hot at 8am, I needed to take my fan to Mass! I was in a big hurry last week to get ready and by the time we stepped out into the street the wind was blowing my hair everywhere! I had already packed away my warm clothes so I had to try and make do with what was not in space bags. Purse – Ralph Lauren ‘Lauren’ Newbury Crossbody Purse in Tan – you can see a close up picture of it here. The tunic top cannot really be seen here. 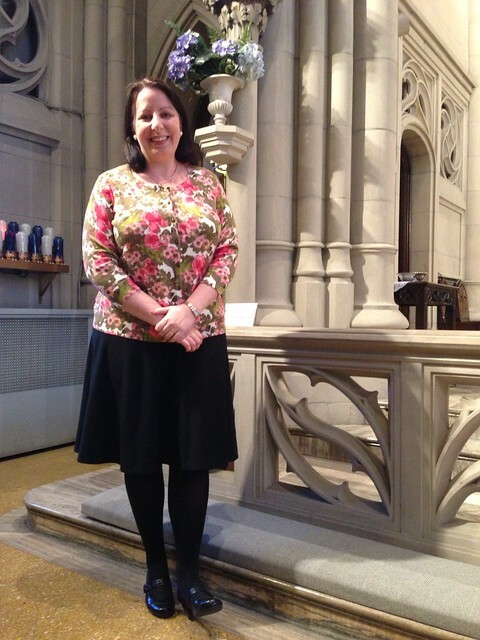 I love it – here I am wearing it to Ash Wednesday Mass at St Peter’s for Pope Benedict’s final Mass. This week was all about keeping cool! We always manage to keep our apartment comfortable in the heat, so stepping outside in the humidity is always a shock. Our beautiful church has no air conditioning and once it gets warm, it stays that way all summer. We are so fortunate to have fans that circulate some air but dressing can be a challenge. 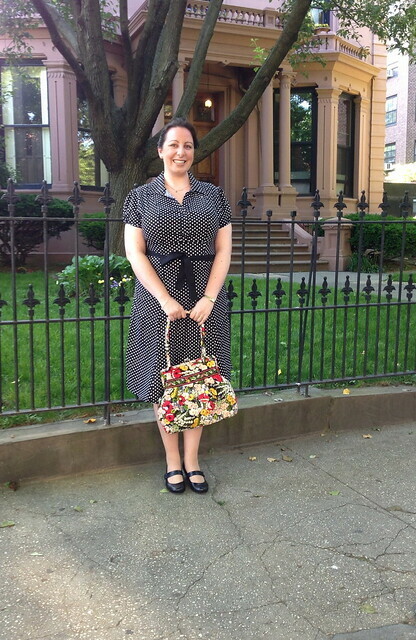 Purse – Vera Bradley Bowler (I think!) in Poppy Fields. Please venture over to Fine Linen and Purple to see more WIWS posts… wishing you all a wonderful week! 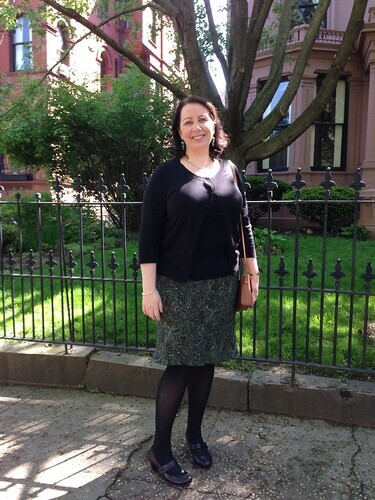 Skirt – The Innovare label… I bought this at Myer about ten years ago! 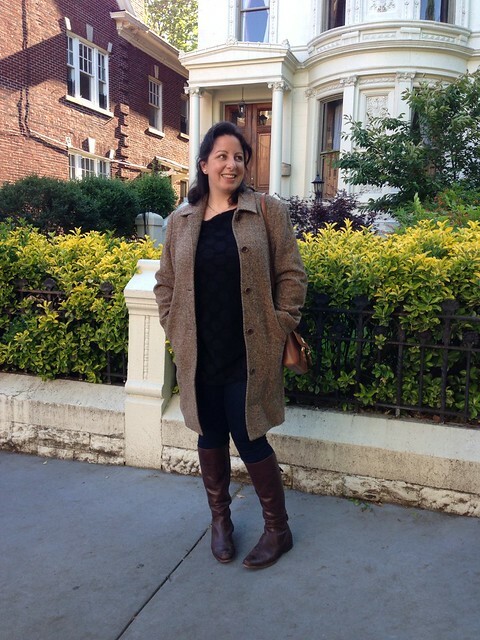 Shoes – Naturalizer Mary Jane’s… yes still the same ones! Earrings – These are green baubles that I bought from The Ark when Nadine and I were shopping on Maling Road… probably about ten years ago as well! 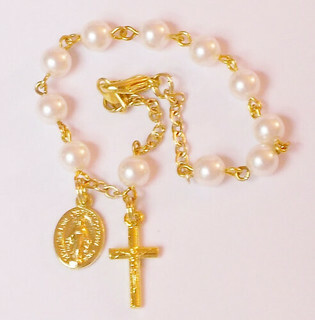 Bracelet – Swarovski Pearl Rosary Bracelet in Gold and White made by Pam at ChapletsNSuch on Etsy. Mass was absolutely fabulous today. 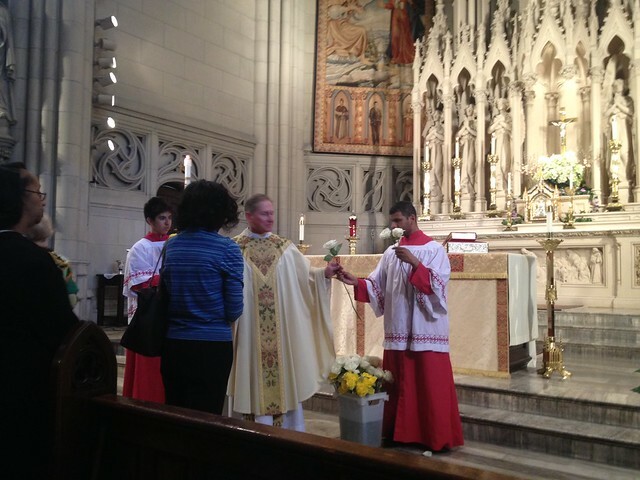 After communion we all sung ‘O Sanctissima’ while our beautiful statue of Mary was crowned with roses. Then, every lady at Mass got a rose and Father Joe read out a prayer that you could tell, resonated with every single person there. There were many tears! Please venture over to Fine Linen and Purple to see more WIWS posts… congratulations Emily on your beautiful wedding! 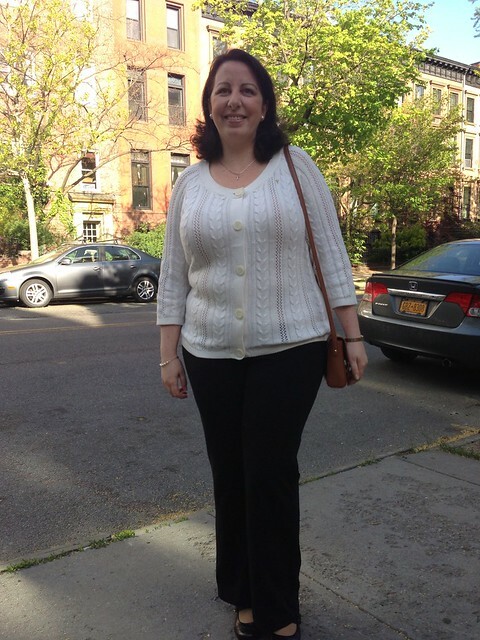 Shoes – Naturalizer Mary Jane’s that I stilthink I will wear forever! 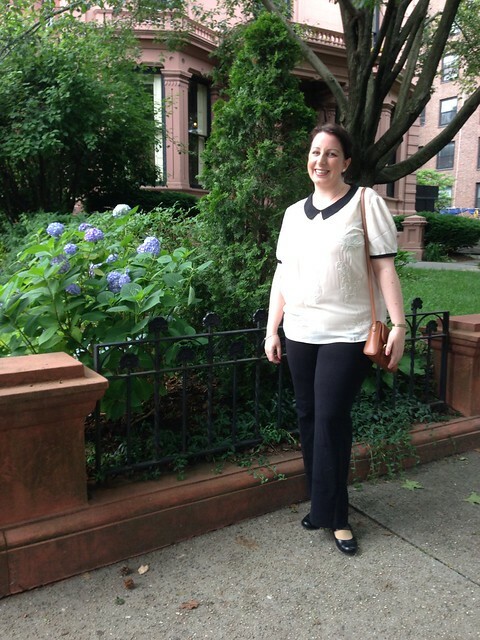 This week, all other WIWS posts are being hosted by Mandy over at her gorgeous site Messy Wife, Blessed Life! Sorry there was no What I Wore for last week. 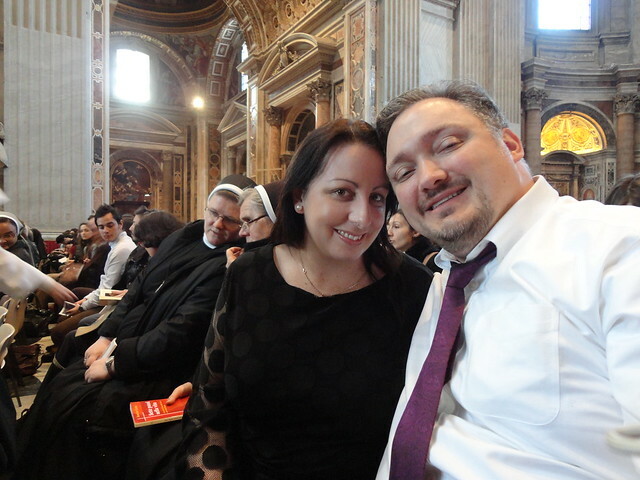 We were at Diocesan training all Saturday and was able to make it to the Vigil Mass. We were in such a hurry that we forgot to take photos! Firstly, I know it has been ages since I’ve blogged! Between getting back from Rome and mum and dad visiting for a month, blogging took a back seat. We are getting back to normal so we’ll see how this goes! This is my first What I Wore Sunday. I love this idea so I thought this would be a perfect way to get back into the swing of things. I got my hair cut a couple of weeks ago. I just went with how it looked this morning when I should’ve maybe done a half up/half down as it was just flat! I was helping out at the 10:30 Mass and left it a little late to get ready this morning. 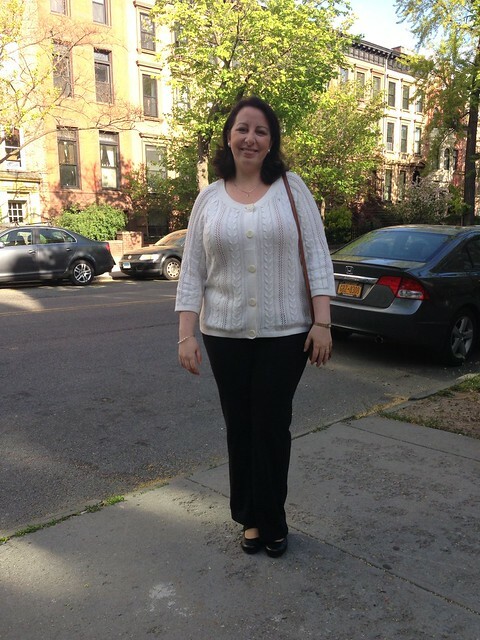 I tried to embrace Spring with my new cardigan… here are the details! You have to check out some of the wonderful WIWS posts over at Fine Linen and Purple… they do an amazing job!